Since Berger’s (1929) first description of the electrical activity of the brain, several approaches have been undertaken in order to correlate the activity at neuronal levels with the origin of the electroencephalogram (EEG). Creutzfeldt (1974) pointed out that the spontaneous electrical activity of the CNS and sensory evoked potentials are highly correlated to intracellularly measured postsynaptic potentials (EPSPs and IPSPs). Ramos et al. (1976) postulated that it is impossible to specify any general causal or predictable relationship between the waveform of an evoked potential and the firing pattern of a neuron. Some authors take the view that the spontaneous EEG activity is an expression of the incessant, irregular background neural firing. Do we have the right to consider the spontaneous activity of the brain as a background noise in the sense of ideal communication theory? Or rather, is the EEG a most important fluctuation, which controls the sensory evoked and event-related potentials? We have written elsewhere that the spontaneous activity plays an active role in the signals transmitted through various structure and recorded at various sites in the brain and that the EEG should not be considered as a noisy signal. Especially, we have assumed that regular patterns of the EEG reflect coherent states of the brain during which cognitive and sensory inputs are processed (Başar 1980, 1983a, b). Originally published in Başar E (ed) Dynamics of sensory and cognitive processing by the brain. 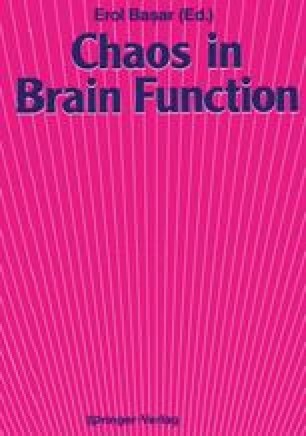 Springer, Berlin Heidelberg New York, pp 203-216 (Springer series in brain dynamics, vol 1). Cross references refer to that volume.